"I think of myself as a New Englander," says Hope Crandall, who grew up in Connecticut and went to boarding school in Massachusetts. She moved west to Lake Forest College in Illinois for a degree in philosophy, then continued on to Woodburn, Oregon, in 1970, for an Office of Economic Opportunity job in migrant child development. "I realized I wanted to pursue multilingual-multicultural education," says Crandall, who enrolled in a grad program at UC Santa Barbara, earned a California teaching license, then returned to Oregon. She taught in a bilingual classroom in Dayton for 20 years, then served 10 years as a bilingual elementary-school librarian in Woodburn. "I wanted to support kids, staffers, and families' literacy in two languages and cultures," she says. "Family literacy is really important." She retired in 2010, moved to Eugene, and now volunteers in the library at River Road/El Camino del Rio dual-immersion school. 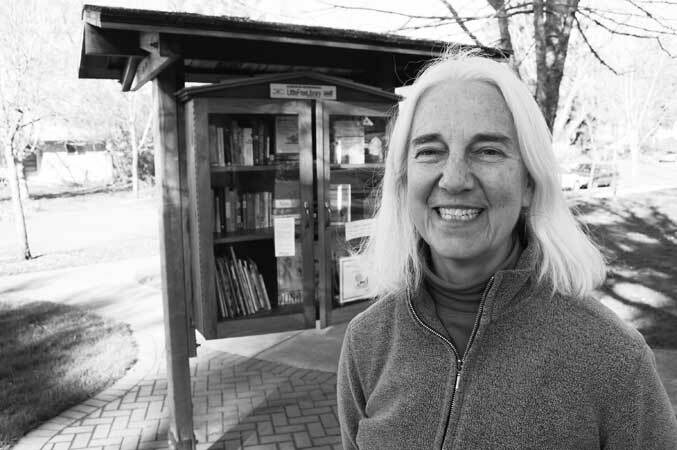 Soon after learning about the "little free library" movement online, Crandall enlisted her neighborhood group, Friendly Area Neighbors, and won a matching grant from the city's neighborhood program to construct an LFL in Friendly Park, 27th and Monroe. "The bottom shelf is for children's books," says Crandall, who invites young readers to look for Dia de Los Niños/Dia de los Libros events at Eugene and Springfield public libraries on the last weekend in April.